As New Zealand mourns the victims of the Christchurch mosque shootings, the traditional Maori haka dance is reverberating around the country. It's a ceremonial dance many might associate with the famous New Zealand All Blacks rugby team. But what does the haka actually signify, and why have so many been performed across New Zealand this week? Haka means "dance" in the language of New Zealand's Maori people. It's a group performance involving synchronised movements, lots of stomping, shouting, and eye-rolling. Matthew Tukaki, executive director of the Maori Council of New Zealand, told the BBC that while it's often thought of as a war dance, "the central theme is actually one of respect". In fact, there isn't just one haka - there are hundreds. Each region and each tribe has its own versions, depending on the occasion and who taught dance to the community. So is it actually a war dance? "Traditionally it was a war dance to basically threaten or warn the enemy," explains Mr Tukaki. "But its meaning has changed." You'll have seen the All Blacks tap into that war dance tradition, but you might also remember a haka being performed whenever the British royals pay a visit to New Zealand. Today, it's performed at all kinds of ceremonial occasions - from receiving dignitaries to birthdays, weddings, anniversaries, or the funerals of chiefs and people of high standing. The words used can change with the purpose. For Friday's memorial, there are nationwide haka planned to show support for the Muslim community. Why is it performed for the Christchurch victims? There have been countless spontaneous instances where New Zealanders have performed the haka in recent days. "I am not all surprised to see this," says Donna Hall, a fellow member of the Maori council. "It's a spiritual response to what has happened and it really is intended to tap the spiritual depth of people." She points out that it's very important for the country to have this "unifying response" right now, at a time when everyone is still shocked by what happened last Friday. Does every Kiwi know how to do it? Pretty much. Traditionally it's something limited to Maori communities, but it has long spread far beyond that. "Let's be honest, the All Blacks can take most of the credit for this," says Ms Hall. It's now something many children learn in school from early on, regardless of whether they are Maori or not. Is it ok for non-Maori New Zealanders to perform the haka? "Yes," Mr Tukaki says emphatically. "This is a special time. We are at a special moment in New Zealand history, but also one that will be important for our future." Cultural appropriation would only be an issue when cultural elements are adopted outside the communities, he says, without any Maori involvement. This is not the case in the current situation. 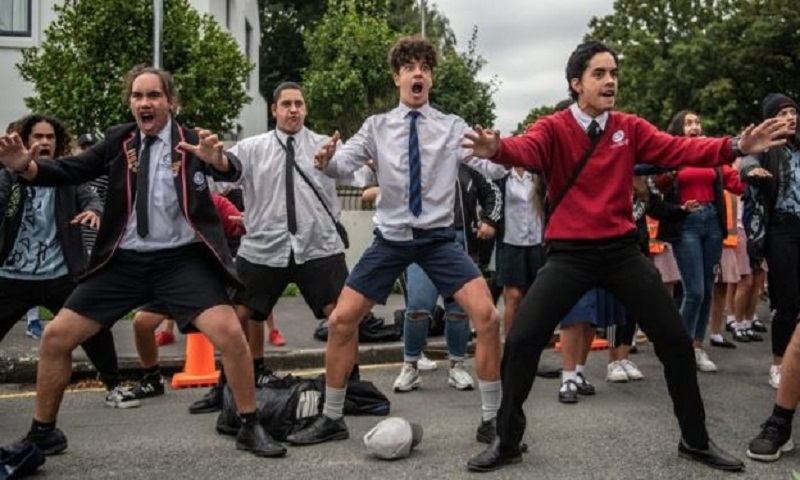 Mr Tukaki believes the many haka videos going viral are a powerful statement in themselves, countering the online hatred that allegedly fed the shooting suspect's thinking. "Let's overwhelm them with love," he says. "I've seen haka from New Zealand, but also from Chicago, New York, London and Sydney. I have seen boys from a Muslim school in Auckland doing it - and it makes me very proud." The New Zealand Maori Council had called for a nationwide haka on 22 March, the day that commemorations marked one week since the shooting. In many places across the country, people came out to mark the day with the ceremonial dance. A special haka planned to take place at the Al-Noor mosque did not go ahead, however - overtaken by the main commemorations at the site where most of last week's victims died. "While there will be many different haka on Friday, there will be one common theme," Ms Hall explained ahead of the day. "We will be taking a stand against hatred, showing love and compassion for our Muslim community."